This month’s Mixology Monday is hosted by Sonja Kassebaum over at Thinking of Drinking. In addition to running a fine boutique distillery, North Shore, with her husband, Sonja is one of the nicest people you’ll ever meet. The topic for February is Absinthe. That much maligned, misunderstood, mistreated spirit, suddenly plentiful again in the US and other parts of the world. Absinthe played a role, whether large or small, in a variety of great cocktails from the 1800’s and early 1900’s – the Sazerac, Absinthe Suissesse, Corpse Reviver No. 2… I’m getting thirsty. So let’s celebrate absinthe’s history, and its future, with all manner of cocktails using absinthe. I seriously thought about just writing up the absinthe drip for this month, as that’s my favorite way to enjoy the liquor. I decided instead to hunt for a new cocktail that shows off how little absinthe it takes to transform a dull collection of ingredients into a fantastic drink. I stumbled upon the Atlantic on the CocktailDB, which gives credit for its creation to “H. Losappio.” I searched through all my cocktail books, and have not yet found another reference for it. Stir over ice until cold as the North Atlantic and strain into cocktail glass. If you shake it, it becomes a White Lily, which I find listed in several other online cocktail databases, but also find no hint of in any of my cocktail books. This is an all clear spirits drink, so naturally, I opted to stir. 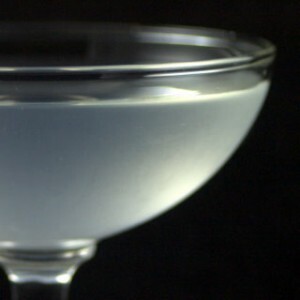 The high amounts of liqueur gives it a mysterious lightly cloudy look that goes well with the name. The original recipe calls for equal parts gin, rum, and Cointreau, and only one dash of absinthe. I found that a tad too sweet. Dialing back the Cointreau makes for a much drier drink I’m tempted to call the North Atlantic. When making this, I mixed everything but the absinthe and stirred until properly chilled and took a taste. It was an ok, if uninteresting cocktail. Adding one dash of absinthe really brought the gin and rum flavors out. Adding one more dash let the absinthe play in the background with hints of anise. I chose to use Pacific Distillery’s Voyager gin and Pacifique absinthe, which naturally pair well together, as the gin uses many of the same botanicals as the absinthe. The Atlantic is a great example of how it takes just a little absinthe to bring a cocktail to life. Thanks, Sonja, for a great topic. Be sure to drop by Thinking of Drinking to see the complete MxMo round-up! I haven’t tried the Atlantic either, Stevi – looking forward to giving it a go. And thank you for the kind words! Cheers. It appears in the 1937 Cafe Royal Cocktail Book, although as an equal parts recipe (well, still a dash of absinthe). This sounds delicious — I’ll have to give it a try, because gin drinks are my latest obsession. I’ve got a bottle of the Voyager gin and just love it. WOW! This is a fantastic cocktail! Just a had a dragon breath inducing Korean Lunch feast and the Atlantic made for the perfect palate cleanser. Wow. Looks like a great drink. This recipe is now on the absinthe cocktail menu at Preservation Kitchen in Bothell, WA (out in DrinkBoy’s neighborhood- right, RH? Thank you, Stevi- you must stop by and collect your props! A little late, but anyway. The Atlantic also appears in the swedish “Cocktailboken” from 1949 by Jansson, Melin and Söderberg. Just like in the comment above the recepie states equal parts gin, rum and cointreau.